The Hamar people are particularly known for their remarkable hair styles. 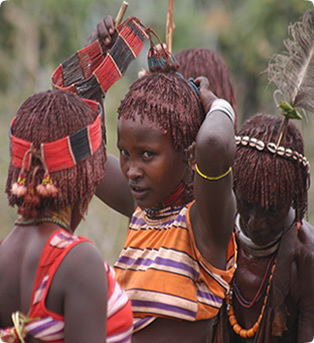 To illustrate their welfare and health the Hamar women mix together ochre, water and binding resin, rub the mixture in to their hair then twist strands again and again to create coppery colored tresses known as goscha. Their body decoration art and every adornment has an important symbolic significance and are eye catching attractions for visitors.